Sewing Machines really sounds like a very interesting topic, doesn’t it? It might be if you were going to the sewing machine shop to buy a new one or if you were going to the Gunnison Pioneer Museum to see the antique sewing machines that are on display. Well, let’s see what is available at the Gunnison Pioneer Museum. We could buy a machine like this Singer Sewing machine that was built in 1907. The machine was a wedding gift from Mr. and Mrs. Thomas L. Beam to W.T. Green and Mary Donnell Green. While you are buying a sewing machine you would probably need a sewing basket like the one in the Gray House at the museum. This basket belonged to Wionona Allen McKee (1883-1975). She married Fred Donald McKee June 26, 1906. This basket was donated by Camille Besse. The Singer Sewing Machine, treadle, in a cabinet. Serial Number N533136 Black with painted floral design with birds. Five small drawers on the left with gold-colored ornate hardware. One tall door on right side which allows entry to the belt. Two doors on the front which open to allow access to the treadle. How about this Manual Singer Sewing Machine, Model #66 in a wood cabinet with accessories? This machine is operated by a treadle and folds into the cabinet for storage. The treadle and stand are of wrought iron with “Singer” in the center. This machine was built in 1929. You could also buy a machine like this Singer electric sewing machine from the 1930’s. The singer Manufacturing Company is on the top in gold letters. There is a light on the back and doors on the front which hold accessories. In the 1940’s you could have a very nice Coronado portable electric sewing machine on wooden base in a black leatherette case, with foot pedal. Included are a box of attachments, a box of rick-rack and seam binding. 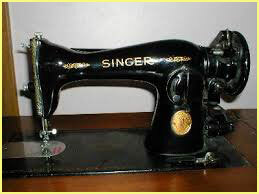 This very nice electric sewing machine, manufactured by Singer Sewing Machine Manufacturing Company. Serial Number AJ454672. Black with gold decorations, built in the 1950’s Plaque on the front reads, “The Singer Manufacturing Company, a Century of Sewing Service, 1851-1951.” This machine was donated by Robert Bathje. The museum has several more sewing machines, than the ones we have written about today. We have all styles and models of sewing machine from the early 1900’s through the 1950’s. We invite everyone to come and tour our museum and if sewing is your thing go to the Moore Building and take a look at our collector’s displays. We have had a pretty good shopping experience in this article, but if we didn’t find what you were looking for, we could start your computer and log onto the internet and shop for more sewing machines. One that just might interest you would be the Janome Memory Craft 12000. This machine is connected to a computer with Real-Time PC connection with horizon link. It has acufeed flex layered fabric feeding system (Quilters love it). Stitch composer: create your own stitches, linear motion embroidery system with 4 new Embroidery hoops, and easy pivoting with the auto presser foot lift. All you have to do is program the sewing machine with your computer and set back and watch it sew your project! You can buy this machine for only $9,999.00. What a buy!!!!! 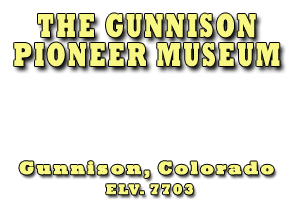 We again ask if you come to the museum on a visit and like what you see, join our volunteers and help make the Gunnison Pioneer Museum even better. Our staff will be more than glad to help you sign up as a Society Member and be a Pioneer Museum Volunteer! That’s all folks, I can’t think of anything else to write about for this week’s article. Thank you, to all of you wonderful people of Gunnison and especially for those of you who graduated from Gunnison High School, remember the All School Class Reunion that will take place in Gunnison August 7 thru August 9, 2015. Will see you there. THE CLASS OF 1960 IS THE BEST!!!!!!!! !